IHEARTCOMIX is the brainchild of Franki Chan, a beloved DJ and animator in the city of LA. The group is involved in so much of the music scene here, from epic Sunday nights at Lure and Drais, to hosting Fool's Gold Day Off last year, and even having a secret Boys Noize EP release party this past summer. The guys at IHC always know how to provide the rest of the city with an epic experience, and this Thursday is no different. 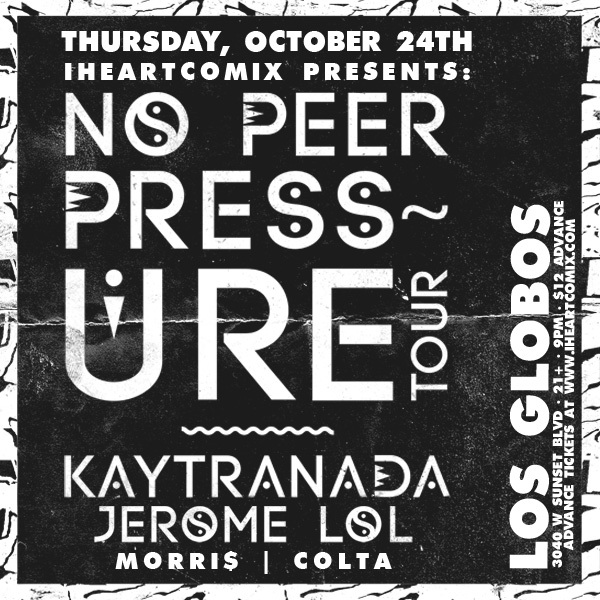 Young producers and DJ's Kaytranada, Jerome LOL, Morri$, and Colta, are coming down to the city of Lost Angels to party at the famous Los Globos this week and this is a must be at event. We've gotten lucky and scored two pairs of tickets for the show on Thursday for two lucky winners. The show is 21+, but for those above the drinking age, we'll be seeing you there. With just a few likes below, you can enter below for a chance to win free tickets! For those that want to buy tickets, they are available here.